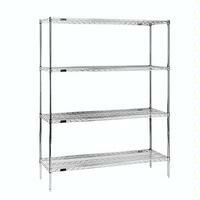 Eagle RediPak Wire Shelving Unit. Patented QuadTruss® design wire shelves, two-piece post assemblies, and tapered split sleeves packaged in one complete box. for increased stability and product retention. Complete shelving unit in one box. 3) and slide shelf collar over split sleeves. A positive lock between shelf and post is created without the use of any tools. Shelving units may be adjusted or completely changed just as easily.